Yesterday they put all their woes behind them to win the Africa Cup and with it a return to two of the World Series tournaments -- the Dubai and Cape Town tourneys. "I am really proud of the players, this is a special group of young stars, with minimum resources but still putting their bodies on the line for national pride. "All I have is respect and love for the rugby sevens squad," Nyamutsamba told The Herald. "If we want to improve, we have to play against the best and getting back to World Series (Dubai and Cape Town) gives us a chance to rub shoulders, learn and experience with the world's best teams... it's something that every small union wishes for. "We have been absent from the world series tournaments for three years now," Nyamutsamba said. "I think the mood in the camp has been very good. The players have gelled very well together and have stuck to each other despite all the adversities and difficulties that we faced, preparing only for three days and struggling during camp for things like transport because we have got no resources. "But the players have brought it and they left everything on the park. They have played for their coach and their manager because they love their coach and their manager. 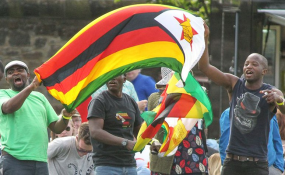 "But the most important thing today is that they have put Zimbabwe rugby where it should be, playing on the world stage where they get to play against the best in the world. "That is playing against the likes of New Zealand, Australia and England and they will do exactly that in Dubai and in Cape Town and they have got a shot again to qualify for Hong Kong. "What is important now is that look we have got a special group of players who have done well. What are we going to do as Zimbabwe rugby about those players? "How are we going to honour them and nurture them and make sure that these are the guys that can take us to the Olympics, to the Commonwealth Games and to the Word Cup" said Mangenje. Despite missing some regulars in Rian O'Neil, Hilton Mudariki, Shayne Makombe and Boyd Rouse, the team, which finished runners-up to Uganda last year, still managed to stage a big fight. Two of the yellow cards went Zimbabwe's way.